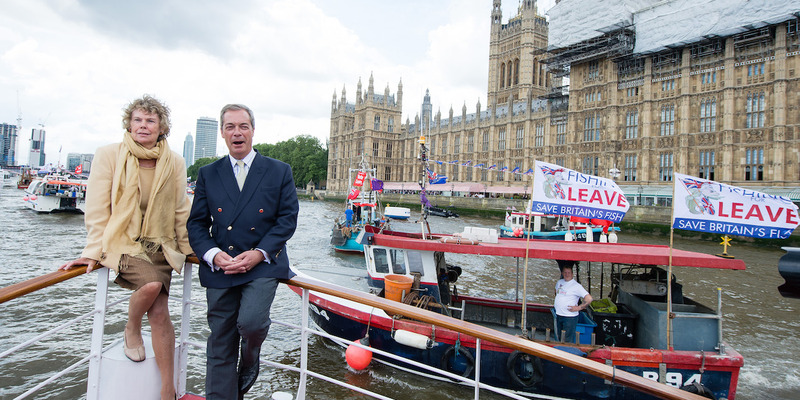 Jeff Spicer / GettyLabour MP Kate Hoey and former UKIP leader Nigel Farage campaigning during the Brexit referendum. “The platitudes we’ve been offered – the grandstanding of “taking back control” – has just been a smokescreen for a sellout,” said Alan Hastings, founder of Brexit group Fishing for Leave. Theresa May’s government made a number of concessions to the EU to secure a 20-month transition deal – none caused more fury than the UK’s concession on fishing rights. As many as 92% of British fishermen voted for Brexit in a bid to hand the UK control of its own fisheries policy and manage access to its own waters. 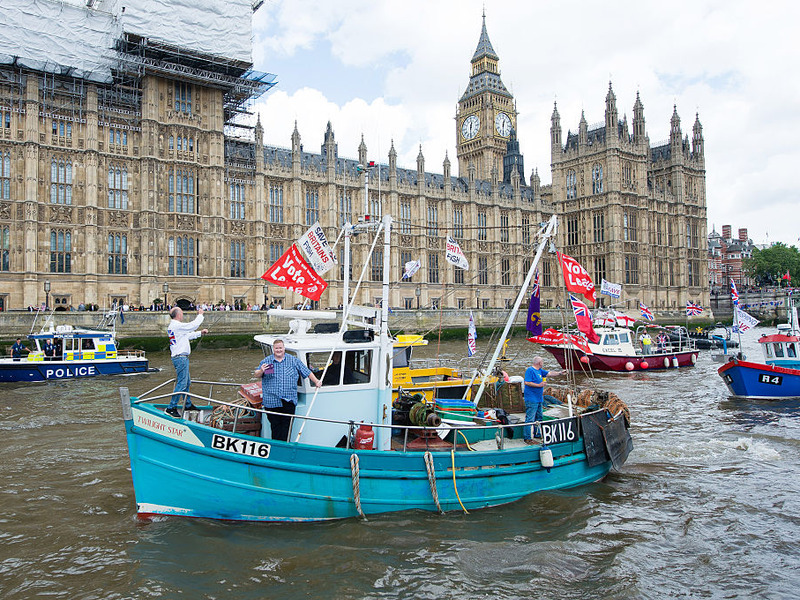 LONDON – Britain’s Leave-voting fishermen say their industry has been sold out by Theresa May in her determination to agree a Brexit transition deal with the EU. On Monday Theresa May’s government made a number of concessions to the EU in order to secure a 20-month transition deal once it leaves the EU next year. None caused more fury than the UK’s concession on fishing rights, which means that the EU will continue to set quotas and allow European fishing vessels into British waters. “I’m absolutely disgusted. It’s a pitiful, abject surrender,” Alan Hastings, founder of Brexit campaign group Fishing for Leave, told Business Insider in the wake of the prime minister’s provisional deal with the EU. The new deal, if implemented, will see the EU “consult” the UK on quotas and access to its waters until 2021, but means it would essentially be required to continue following the EU’s much-maligned Common Fisheries Policy (CFP). Hastings said a “spineless” Brexit secretary David Davis had failed to even try to negotiate a better deal for fishing rights. “The UK hasn’t tried to negotiate a damn,” he said. “In a negotiation, one party sets out their terms and another sets out theirs. You meet in the middle. But the EU has gone further and further and further away, and we’ve just followed them. “David Davis is the weakest, simplest, most ineffectual, useless, and spineless man that’s ever existed. He’s a national disgrace,” Hastings said. He believes the industry will be left “staring down the barrel of the gun” and faces “obliteration” because its lack of a veto will mean the EU abolishes the 12-mile coastal limit which currently legally protects British inshore and shell-fishermen from European fishing boats. “The only thing between us and obliteration is MPs rejecting this deal,” he said. 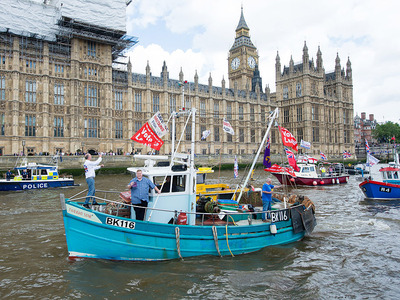 The news on Monday prompted Fishing for Leave – which also organised the now-notorious flotilla of fishing boats to sail down the Thames shortly before the 2016 referendum – to organise another stunt on Wednesday. Brexiteer Tory MP Jacob-Rees Mogg plans to throw fish from a boat into the Thames outside parliament to protest the terms of the transition deal. A large majority of UK fishermen voted to leave the EU – one poll suggested the figure was 92% – in a bid to hand the UK control of its own fisheries policy and manage access to its own waters. Currently, the EU sets quotas under the CFP and allows European fishermen reciprocal access to British waters, which British fishermen say has been destructive for their industry. The issue is of particular concern in Scotland. John Lamont, a Scottish Tory MP who represents the coastal constituency of Berwickshire, Roxburgh and Selkirk, threatened on Sunday to vote down a final Brexit deal in parliament if it was unfavourable for the fishing industry. He told Business Insider he was “disappointed” by the UK government on the transition deal. “Brexit is a huge opportunity for our fishing communities including those in my constituency,” he said. “After the implementation period is over, full control over our waters must come back to the United Kingdom from Brussels.